By Niamh Foran | February 11, 2013. The Dublin footballers continued their winning form in the Allianz National Football League today with a 1-11 to 0-04 win over Kerry in Tralee. Dublin dominated the game in the first 20 minutes, outscoring the green and gold by six points to nil. The opening point came from Bernard Brogan in the 6th minute, followed by points from Brogan and Paddy Andrews, which helped to develop an early lead for the Dubs. The on form Brogan added five more points in the first half, including an impressive long range effort in the 26th minute. It took a Patrick Curtin point in the 22nd minute to finally open the Kingdom’s account, on a day when not much seemed to go right for them on their home ground. Dublin’s only glimpse at a goal chance in the first quarter was thwarted when referee David Coldrick awarded a free in to Dublin, which Brogan converted. The 28th minute of the game saw Diarmuid Connolly stretchered off the field with an ankle injury and replaced by forward Philip Ryan. Tomás Ó Sé then doubled Kerry’s tally for the day, converting a second point from a good break further out the field. Bernard Brogan then missed the opportunity to score from another free, stemming from a tackle by Patrick Curtin that saw him yellow-carded. Paddy Andrews had a great chance to register Dublin’s first goal in the 35th minute, executing a powerful shot that was stopped by Kerry keeper Brendan Kealy. The gap was six points at the half-time whistle. Dublin headed to the tunnel with a 0-8 to 0-2 lead. The second half saw much of the same from both sides. Dublin continued to dominate all over the field with fantastic individual performances from Bernard Brogan, Paddy Andrews and Tomas Brady, who started at mid-field. Eamon Fitzmaurice attempted to alter proceedings by bringing on two all-star players, Kieran Donaghy and Declan O’Sullivan. 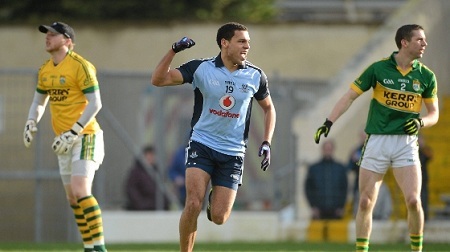 However, the Dublin force seemed too much for the Kerry men as Dublin continued to dominate the game. This was despite the sending off of Michael Darragh MacAuley in the 56th minute for an off the ball incident which saw Donaghy booked. The last 20 minutes of the game saw points from Philip Ryan and the on form Brogan, as Dublin finished out the match winning with a score-line of 1-11 to 0-4. Dublin will hope to continue their current form when they welcome Mayo to Croke Park on March 2nd. Also on Sunday, the Dublin Hurlers beat Wexford with a score-line of 1-19 to 0-16, to win the Walsh Cup.